An experiment five floors up…. Happy new year! Did you know that it is thought to be good luck to eat black eyed peas (a subspecies of cowpeas) on New Year’s day? I grew black eyed peas for the first time this past summer. Late summer brought some jerk beetles to my cucumber and squash plants. Farmer Russell advised pulling the affected plants and replacing with black eyed peas ASAP. They’d help fix the soil, and then I’d be able to compost the plants and dry and eat the beans. They all sprouted within three days, and grew FAST. I tied them to the lattice that I used for the cucumbers. The some pods were 7” long, though most were about 6”, with about 10-12 beans per pod. I let the pods stay on the plants and dry on their own before picking them. I wound up with about two cups of dried beans. I stored them in a jar with one of those silica desiccant packets. I had rice and black eyed peas for dinner on New Year’s day. I made everything in my small crock pot and used chicken stock (salt free) that I made and pressure canned in August. Very happy with the results! This made about 2 servings. Drain black eyed peas, then add to a small crock pot with onion, garlic, stock, salt, and pepper. Set to low and cook for 6-8 hours until beans are tender. If you have excess liquid when beans are finished, you can add it to the brown rice when cooking. It will add some extra flavor. Serve beans over brown rice and garnish with green onion or parsley. *NOTE: I am writing this post during Mad Men commercial breaks. Trying to multitask. Last week I noticed that my lovely baby cucumbers were beginning to shrivel. Some research revealed that they might not be properly pollinated, and I learned about male flowers and female flowers on cucumbers. However, their close proximity to the very successful string beans would indicate that I have enough pollinators flying around. More on that later. But beans are wonderful right next to them. Winston is clearly doing a great job. One thing Farmer Russell insisted I do to help the cucumber plants is thin them even more than I had earlier. I found three of the smaller plants and pulled them out. I had had them several inches apart, but more space would be better. Two of them had a few roots left, so I threw them into an empty pot I had. At first they shriveled, but then the raaaaains came. Lo and behold, they’ve rooted and I now have two more plants. Didn’t really expect that, very happy about it. Next to the new cucumber plants is Ali’s former pepper plant. She had it inside for several weeks after she bought it and realized that it really wasn’t going to grow in her apartment. I adopted it and brought it upstairs. Yesterday I noticed that it had sprouted several new sets of leaves and is starting to bulk up. My two pepper plants (bell pepper and jalepeño) are also starting to grow new leaves and get….stocky…., but they’re both still a bit short. They area also both making peppers right now so I gave them some plant food, as I had read it’d be good to do once they start producing. Speaking of rain, we got several days of heavy rains last week, thanks to the end of that hurricane and some storms that came to us from the midwest. I had collected five big buckets of water and several smaller containers that were just sitting there, full, waiting to be used, but I wound up dumping them out because I didn’t need them and they were starting to get funky. I’ve only needed to water the terra cotta pots, not the square buckets or larger tanks. They’ve all been very nicely saturated for the last two weeks or so. I figured I’ll collect water later this week when we get more rain, which looks like it’ll be Monday through Wednesday, just in case. 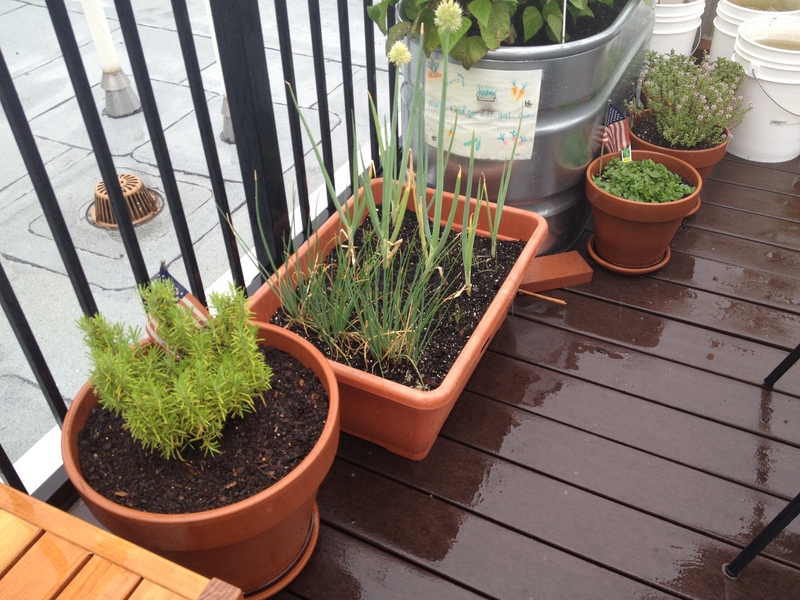 Here is the rosemary in the new large pot I got last week, and you can see the deck is wet. After three years, it was totally root bound in the smaller pot. I gave the plant a good trim and made rosemary simple syrup. It now has several new soft green leaves, just a few days later. This guy spent a ton of time flying all over the garden. He was most pleased. I don’t know what the hell this is. 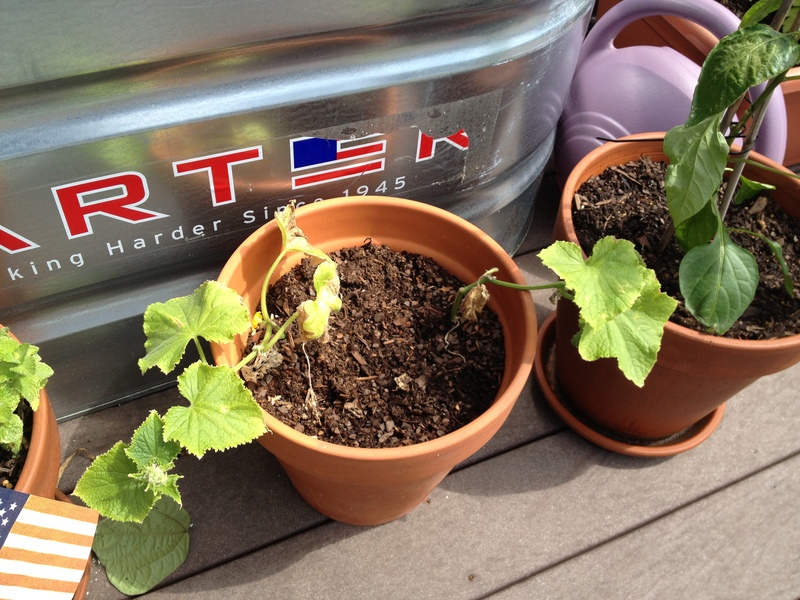 The cucumbers have been looking much better in the last three days or so. I hope that bee has been telling his friends to come over. Finally, how could I not talk about my marvelous compost? The threat of high winds made me bungee cord all of the roof chairs to the fence and fold the tables down to protect them. I knew there was little I could do about the plants, though. Thankfully, the storm here wound up being a whole lot of nothing (but about 40 miles away at the distillery we had horizontal rains for a few minutes.) Anyway, after untying the chairs, I switched the compost bucket top with holes to the one without, bungeed it on, and rolled it around the roof for a bit to mix it better than I had been doing with just my prongy cultivator tool. Perfectly mixed! Looks like I’ll just need a few more weeks before I will be able to start to use it. Before tossing around the roof. Lid is secure, nothing falling out of the holes, perfectly mixed! Last Friday afternoon was pretty busy. Had to deal with some guests and some stench. So, these guys showed up at the same time and pretty much set me off for the day. This fuzzy spider…who is he? What kind of bee is that? Yellowjacket? Or just some scary jerk? I can hear the chewing into the white oak whisky barrel table. Not pleased about that. The spider was furry…and had orange and blue spots? I have named him Oliver. He may not be with us any longer, as he walked through the white powder. More on that later. Those aphids were all over the radishes. I did not see them in the morning when I had picked a few, but by the afternoon of this photo…ALL of the radish leaves were covered in them. Not the beans or cucumbers in the same bin, though. Interesting. Must be tastier. Anywhooo…I pulled up all of the radishes at that point. They were ready to be picked, and I had been eating them for a few weeks. Separated the radish from the leaves and tossed the leaves into the horrible smelling watery compost. Would really be disgustingly impossible for anything to survive in there, so as an immediate pesticide solution, I think I did a good job. 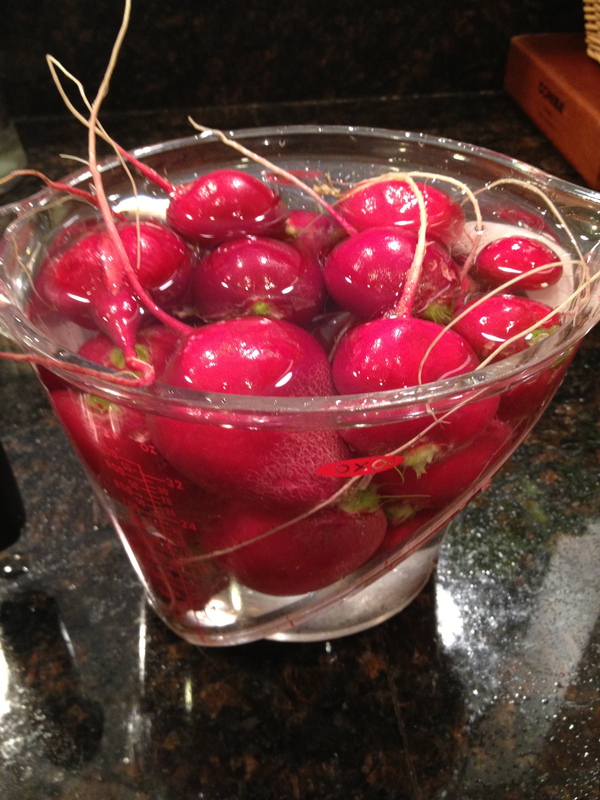 Then I pickled the radishes. Farmer Russell recommended I use diatomaceous earth for the aphids, which would essentially dry them out by slicing up their bodies. It’s crushed silica. ShMerin had used it in the past for uninvited guests in her home and seconded the recommendation. No additional pesticides added. She suggested I wear gloves and a dust mask (already had a bunch at home) and use a soft brush to paint the powder on the underside of the leaves. I think I looked pretty snazzy. I’d finally given up on the anaerobic composting in the bucket. Why? Smelled like a broken sewage treatment plant, that’s why. Had to convert to “normal” traditional aerobic composting. There are tons of instructionals here on the interwebs. Basically, I picked up an 18 gallon Sterilite bin from Target (on sale last week, too) for about $6. Drilled holes all over it. Top, bottom, all sides. Some compost pics from the past week. This stays covered all the time. I just toss my food scraps in there. ONLY plant material, no fats or oils at all. Layer of paper litter and hay as “brown” material to offset the rest of the wet stuff. Collected water that came from the other bucket that was dumped onto the hay. Then I tossed it around. Later contribution of hazelnut shells, coffe grinds, radish ends, washed and crushed eggshells. Another addition of hay and litter. More of the stinky water added back to wet it down. Verdict? Stink is greatly reduced, and as soon as all of the old water is absorbed back into the mix I imagine it will be even better. I already see it starting to break down after about a week in there. Then I went downstairs and took a shower. I smelled like…well, I needed to take a shower. I was pretty happy for the first few weeks with the garden in 2011. My neighbors were very concerned about the wee baby plants being exposed to sun, and before my week long absence in mid April, they insisted I create a cover of some sort. Despite my assurances that plants, do, in fact like the sun, this is what we came up with. 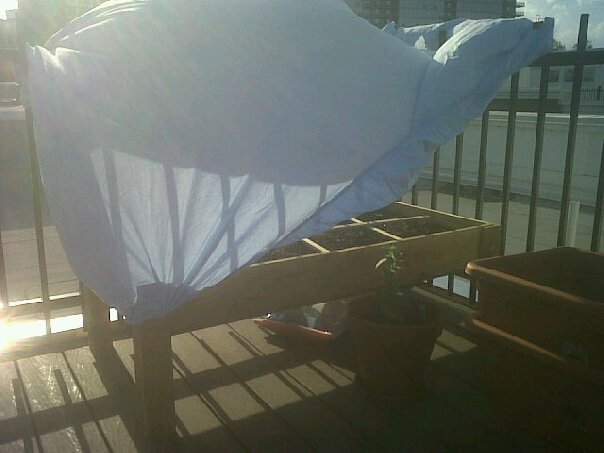 The sheet didn’t last too long, and the plants lived after all. Everyone was happy. All went along smoothly for the next few weeks. At this point I was happy with the garden’s progress. Things were growing and I was starting to be able to pick here and there for tasting. Rain was falling on a fairly regular basis. My municipal water is a bit on the swimming pool side, so I had a watering can that I’d fill up in from the tap in my condo and allow to sit for a few hours before watering if it got too dry up there. Also, the bugs. I’m five floors up, surrounded by air conditioning units, Trex decking, and very few actual trees. Any bugs were welcome. I wanted them to all talk to each other and come to my garden to pollinate things and do whatever it is that bugs do. The lady bug below was a minor victory, even if it was just lost. The photos in the gallery below are from late April-early July 2011. The close ups were taken with the Nikon 60mm f/2.8 d af micro lens that my brother got me as a grad school graduation gift that year. I HAD to play with it, and what better subjects? I’m quite pleased with the way they came out, actually.